Ever since the Fourteenth Finance Commission (FFC) recommended the tax devolution of 42% of the divisible pool to the States, many have held it responsible to the fiscal woes of the Union government. It is not surprising when the Finance Minister complains about it for all his fiscal difficulties, as he has to find a scapegoat. However, when a respectable senior editor such as Mr. Ninan, in his widely read editorial ruminates about "...the overly generous recommendations of the Finance Commission" resulting in the "... Central transfers to State governments ballooning by an astonishing 60 per cent in 2014-15" resulting in the total revenues in that year growing by 32%, we need to look at the matter more seriously. Is the FFC really the demon responsible for the Centre's fiscal woes, or is it a fall guy? Incidentally, the FFC's recommendations came into effect in 2015-16 and not in 2014-15, and there must be something missing in Ninan's story of transfers to States ballooning by 60% in 2014-15 that needs unravelling. But, before that, it is important to understand how generous the FFC's "bonanza" really was. Indeed, 42% tax devolution, as compared to the 32% recommended by the previous Commission, looks a quantum jump. But, as the Terms of Reference of the FFC required it to consider total revenue expenditure requirements of the states without making a distinction between plan and non-plan, the Commission had to subsume the grants for State plan schemes (Gadgil formula grants) in its recommendations. This was equivalent to 5.5% of the divisible pool. In addition, as the Commission included the area under forest cover as one of the factors to determine the share of individual States in tax devolution, and also decided that it will not give any grants other than those to achieve the States' budgetary balance, local governments and disaster relief. The amount saved on those discretionary grants was equivalent to 1.5% of the divisible pool. Thus, the increase actually is from 39% to 42%! How did it translate in terms of actual numbers? The accompanying table and the graph give the real picture of the volume of Union transfers to States. In terms of % of GDP, tax devolution increased by one point in 2015-16 due to FFC's recommendation, but grants declined by 0.4 of a percentage point. 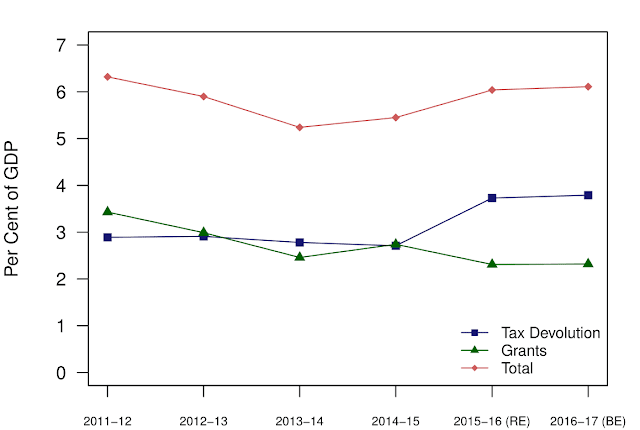 Similarly, the share of tax devolution in Union taxes increased by 7.5 percentage points in 2015-16 over the previous year, but the increase in total transfers was just 2 percentage points! In fact, if one looks at a slightly longer time series, despite the Finance Commission's "bonanza", the total transfers relative to GDP actually declined from 6.3% in 2011-12 to 6% in 2015-16. The decline in the grants was due to the inclusion of plan grants in FFC's recommendations and partly due to the restructuring of the Centrally Sponsored Schemes. As mentioned earlier, FFC's recommendations came to effect in 2015-16 and the sharp increase in the transfers noticed in 2014-15 was actually not an increase, but an accounting change. It may be recalled that until 2013-14, grants to various Central schemes were given directly to the implementing agencies, bypassing the States. This practice was reversed in 2014-15 and the increase was due to change in budgetary practice and nothing else. Why did FFC decide to give slightly higher tax devolution, albeit marginal of about 3% of the divisible pool? FFC's analysis showed that between 2002-05 and 2005-11, Union government's revenue expenditures on State subjects increased from 14% to 20%, and on Concurrent subjects the increase was from 13% to 17% (see para 6.17 of the report). Thus, the Union government never found the lack of fiscal space a constraint in foraying into spending on various activities in the State List, quite a few of them in the nature of transfer payments. The arguments by the States was that why should the Finance Commission leave so much fiscal space for the Union government to intrude into their area though various Centrally Sponsored Schemes? While some of the Central Schemes are meritorious and it is therefore important to ensure minimum standards of services in respect of them across the country, FFC decided to provide greater flexibility to the States to spend on the subjects under their jurisdiction. The fact of the matter is, in the prevailing situation, it is not the Finance Commission, but the Union government that determines the total volume of transfers to the States, and blaming it for Centre's fiscal woes is like looking for a fall guy. The Finance Commission can only determine the volume of untied transfers, and that is what FFC did. The Finance Commission cannot be held responsible if the Union government did not pass on the benefits of lower oil prices but decided to levy cesses and surcharges on petroleum products to use the funds to initiate more schemes and expand on the existing ones. The author is an Emeritus Professor, NIPFP and Chief Economic Adviser, Brickwork Ratings. He was a Member of the Fourteenth Finance Commission. The views are personal. The Ministry of Finance has recently invited comments on the report of the Task Force to establish the Financial Redress Agency (FRA). The FRA is planned as a one stop forum for speedy and convenient settlement to complaints of retail financial consumers. In this article, I tell some of the back story, highlight the shortcomings of the current regime, and present the design principles of the FRA. Consumer protection involves prevention and cure. Prevention requires laws that set financial regulators on the objective of obtaining fairplay by financial firms. Cure requires effective complaint handling mechanisms. The current financial regulatory regime is lacking on both counts. Gaps in prevention have resulted in unfair sales practices (e.g. see problems in bank led distribution) and poor product design (see problems in insurance). Such gaps have contributed to numerous crises involving abuse of consumers in recent years. Consumers are given the runaround. There are many locations in India through which the existing redress forums operate: 16 locations for the banking ombudsman, 17 for the insurance ombudsman and one by PFRDA. SEBI and PFRDA primarily rely on online systems. The consumers are burdened with identifying the right channel and bearing the travel and other related costs. Lack of uniformity. Consumers and financial service providers (FSPs) have to deal with variations in approach, processes, capacity, service levels and powers across these forums. SEBI runs a facilitation system and is not empowered to award compensation. Therefore, it cannot do much if FSPs deny wrongdoing. PFRDA's system is quite similar to SEBI's. However, last month it appointed a part time ombudsman who can award compensation. The banking and insurance ombudsmen do award compensation. However, the approaches vary significantly. The banking ombudsman awarded compensation in 18 cases in 2015-16, out of over one lakh complaints. In contrast, the insurance ombudsman awarded compensation in nearly 25 percent of the 30,000 cases. In addition to variations in the redress systems, there is a lack of uniformity in legal frameworks and supervisory capacity of regulators. This leads to regulatory arbitrage. FSPs try to push expensive and opaque products where they spot regulatory gaps or sub-optimal redress mechanisms. Lack of specialisation. Cross functional teams are required for effective redress in forums like ombudsmen, which aim to resolve matters mainly though mediation. These teams bring together skill and experience in mediation and adjudication, domain expertise, industry experience and appreciation of consumer protection issues across consumer markets. The current system does not offer such possibilities. Gaps in sectoral redress. Financial markets are converging. As a result, most intermediaries sell a variety of products. For example, banks are also the leading mutual fund and insurance distributors. An unhappy consumer may struggle to identify the party at fault and the relevant redress forum. Problems of this nature have been highlighted in the past. An IRDAI committee on bancassurance had emphasised making banks accountable to the banking ombudsman for insurance policy servicing complaints. Conflicts between regulators handling individual complaints. Conflicts may arise if a regulator has an ability to deny or delay admitting to systemic problems. A redress forum dependent on the regulator would suffer from this flaw. A weak formal feedback loop between redress and regulatory functions leaves the system vulnerable. For example, the mis-selling in ULIP products may have flourished for an extended period owing to this. Moreover, levying fines on FSPs and awarding compensation to consumers is populist, but can mask prolonged existence of deeper failures of regulation. For instance, FSPs may be under pressure to comply even when they believe they are not in the wrong. This can be due to the fear of regulatory retaliation in some manner, in a non rule of law environment. When uninformed consumers are asked to navigate this landscape, they are often hesitant and likely to avoid the formal financial system. This will give a sustained bias in the portfolio allocations of households, which is bad for the economy. The shortcomings in the current consumer protection regime should no longer be ignored. The push for financial inclusion has gained significant momentum. First time consumers account for 260 million bank accounts, 130 million insurance policies and 8 million pension accounts. The push towards cashless payments has similarly brought millions of new consumers to financial payment providers. These new consumers have limited resources, low literacy and even lower financial literacy. There is an urgent need to build the financial regulatory machinery that will protect consumers better. In 2009, the Raghuram Rajan committee on financial sector reforms highlighted the regulatory gaps, overlaps, inconsistencies and regulatory arbitrage in the financial sector due to the many laws and agencies. It recommended that regulators work through a collective process to protect consumers and raise financial literacy levels. In the same year, the Committee on investor awareness and protection, led by me, documented the widespread mis-selling that retail consumers face. It built a case for common minimum regulatory standards for retail financial advisers. In 2011, the Financial Sector Legislative Reforms Commission (FSLRC), chaired by Justice B. N. Srikrishna, began its work to review the laws governing financial sector. It cemented the understanding that consumer protection was the essence of why we do financial regulation. In 2013, it conceptualised a framework for consumer protection and the FRA. The accompanying draft Indian Financial Code, a model financial sector draft law, placed consumer protection at the centre of financial law. In 2015, the finance minister, in his budget speech, announced the setting up of a Task Force to establish a sector-neutral financial redress agency. Later that year, the Sumit Bose committee to recommend measures for curbing mis-selling further strengthened the case for a unified FRA. It identified regulatory arbitrage; mis-aligned distribution incentives; poor product design; and disclosure norms as key reasons for mis-selling. In 2016, the Task Force submitted its report to the finance minister. This report has now been released for public comment by the Ministry of Finance. Redress of complaints by FSPs. Easy access. Consumers of all financial products would go the unified FRA. They would not need to know which regulator is involved. Consumers would be able to access FRA in a user friendly manner in multiple languages through letters; telephone; missed call service; email; mobile apps; text messages; and video. In addition, local facilitation centres would be available to handhold consumers. Consumers would receive regular status updates on their complaint. Timely redress. FRA's processes, quality and capacity of teams, use of technology, quality of regulations and regulatory supervision: all these would be optimised to deliver timely redress. There would be a fast-track mechanism for simple complaints. In each case, FRA would first ask the financial firm to offer a solution. Then, the FRA would form a preliminary view and discuss this with the consumer. The complaint would be resolved if a consumer is satisfied at this stage, or through mediation on conference calls. If mediation does not work, FRA would make a decision through adjudication based on facts. It would avoid court like processes. Regulatory feedback loop. FRA would be independent of regulators, and have no incentive to cover up problems. It would create valuable databases about complaints, and give feedback to regulators to help improve regulations and supervision. Accountability. FRA's accountability would be ensured through disclosure requirements and performance reviews. The FRA Board would be appointed by the regulators. It would have an Independent Assessment Office to consider complaints against its standard of service. In addition, orders by FRA would be appealable at the Securities Appellate Tribunal. In Indian public policy, there are many good policy proposals, but the implementation capacity is often weak. It is difficult to construct State capacity in the various agencies of the government. The report has worked out the detailed project planning for the construction of FRA. The Ministry of Finance has setup many new financial agencies in the past. These include SEBI, IRDAI, PFRDA, SAT, FIU, etc. In my knowledge, most of these projects had suffered from lack of adequate preparatory work with consequential delay in implementation. The project planning for FRA has avoided these pitfalls and provides a comprehensive blueprint for establishing this agency. Consumer protection is the reason why we do financial regulation. The existing financial regulatory system requires major reforms in order to reorient it towards the objective of consumer protection. This will be a long journey. Implementing the FRA Task Force report would be an important step in that journey. The author was formerly Secretary (Expenditure & Budget), Ministry of Finance; Chairman, PFRDA; Member-Convener, Financial Sector Legislative Reforms Commission and Chairman, Public Debt Management Agency. How would demonetisation have shaped up under an improved RBI board? Demonetisation has brought fresh attention to three aspects of RBI's board: autonomy, accountability and transparency. Patnaik and Roy (2017) demonstrate how the RBI Act lags behind sound international practices on these three counts. The main financial reforms process in India has been the gradual enactment of the draft Indian Financial Code (IFC) drafted by Justice Srikrishna's Financial Sector Legislative Reforms Commission (FSLRC). In this article, we refer to version 1.1 of the IFC. FSLRC strongly emphasised resolving deeper public administration problems that have bedeviled State capacity in India. One would assume that IFC solves many flaws in the functioning of the RBI's board which have been revealed in the demonetisation episode. However, both the FSLRC report and IFC have been previously criticised for undermining RBI's autonomy. After the demonetisation event, the IFC has been criticised for recommending a smaller RBI board. In this article, using information available in public domain, we try to piece together what transpired at the RBI board when the decision to demonetise 86% of the currency in circulation was taken. We compare the RBI Act against the IFC. We play a `war game' of thinking through the demonetisation drama under the IFC, and examine the extent to which IFC might have produced a stronger and more capable RBI. This war gaming sheds new light on how to create State capacity in India. What was the role of the RBI Central Board in the demonetisation decision? The recommendation was made in a meeting of the RBI Board held on 8th November, 2016. *Independent directors are employees of neither the Central Government nor the RBI. Under the RBI Act, only the Governor, the members of local RBI boards and independent directors are allowed to vote at meetings (Section 8(3), RBI Act). Table 1 indicates that out of the maximum sanctioned strength of 21, 11 seats were vacant on November 8, 2017. Out of the 10 appointed members, 8 members attended the meetings, and only 4 of them could vote. Amongst the voting members, 2 were independent members. There has been no public disclosure about voting by the members present on 8th November, 2016. RBI has a (a) central board comprising of Governors and Deputy Governors and (b) four regional boards. One member, to be nominated by the Central Government, from each of the regional RBI boards is a member of the RBI Central Board. The discourse faults FSLRC for having abolished the regional RBI boards, and downsizing the RBI Central Board. Table 2 compares the provisions of the RBI Act and IFC on board composition. Popular discourse has faulted the IFC for making the RBI Board vulnerable to Central Government's influence. Table 2 shows that on the contrary, the provisions governing board composition in IFC have tilted the board strength towards members of the board who are RBI employees. Despite a large sanctioned strength and being overloaded with independent directors, the RBI board is now being accused of having not exercised sufficient independent discretion at the meeting held on 8th November, 2016. Thus, the sheer board size did not have the intended outcomes. Modern thinking on the size of committees and boards suggests that a size range of 17 to 21 is excessive. It is likely to create a greater free rider problem and inferior discussions. The obligation to fill up vacancies on regulatory boards is crucial. The board-size becomes moot if the seats of independent directors are vacant. At the time the decision was taken by the RBI Board, only 3 out of the 10 independent members were appointed. Table 3 compares the provisions of the RBI Act and IFC on the consequences of not filling up vacancies on regulatory boards. Decision-making by members of a board is inherently connected with the way meetings are convened and conducted. Table 4 gives a comparative overview of the provisions in the RBI Act and IFC governing the conduct of meetings of the RBI Board. First, both IFC and the RBI Act are lacking in the details to be furnished to members of regulatory boards before the meeting is convened or at the time the meeting is held. Unlike commonly accepted secretarial standards which require an agenda and notes on each proposal tabled at a meeting of corporate boards, the laws governing regulators do not elaborate these requirements. Presumably, this has been left to the regulator's bye-laws which governs the internal affairs of regulators. Second, again, contrary to popular perception, IFC vests more voting power in the full-time members of the RBI board, as compared to the RBI Act. It puts all board members at par with each other, in so far as their voting rights are concerned. Third, while IFC requires a shorter notice to be given for meetings, as compared to the RBI Act, it has more robust processes for convening meetings at notice shorter than that required under law, including recording reasons for such shorter notice. Under both the RBI Act and IFC, the quorum can be constituted without independent members. This is problematic and needs further deliberation. The way the relationship between the Central Government and the RBI is codified in the law, can hamper or increase the independence of regulators. Table 5 gives a comparative overview of this relationship, as codified in the RBI Act and IFC. Can the Central Government give directions to the RBI board? Yes (Section 7, RBI Act) No. Table 5 indicates that the IFC has provided for an arms' length relationship between the Central Government and the RBI. While the RBI Act gives considerable powers to the Central Government to supersede the board and issue directions to members of the RBI Board, such powers are absent from IFC. To be clear, it is nobody's case that the Central Government had used its direction-making powers under the RBI Act in connection with the demonetisation decision. However, being de jure indicators of independence, they are necessary though not sufficient conditions for ensuring independence. Accountability can be ex-ante or ex-post. Ex-ante mechanisms comprise of processes which must precede the performance of any function. IFC requires all quasi-legislative instruments to be issued through a robust regulation-making process comprising a cost-benefit analysis and a public consultation process. It requires the RBI Board to review regulations made after every three years. These measures are absent from in the RBI Act. As regards executive and quasi-judicial functions, IFC provides for a time-bound licensing process, specific grounds for rejection of licenses, an administative law wing that is independent of the other departments of the RBI, for taking enforcement actions, and appeals against executive orders of RBI. These are ex-ante mechanisms to ensure that each function is discharged as per process and rule of law. However, the power to "recommend" demonetisation is neither a quasi-legislative power nor an executive or quasi-judicial power. Hence, these ex-ante mechanisms built in IFC may arguably have not been applicable to the proposal. Ex-post accountability mechanisms generally perfrom the function of auditing performance and conduct. Table 6 gives a comparative overview of other accountability mechanisms that would have been applicable in the exercise of a recommendatory power. What does the internal audit include? NA (a) Whether the RBI is functioning in accordance with applicable laws, (b) Whether the bye-laws governing internal processes of the RBI promote transparency and best governance practices, (c) Whether the RBI is complying with the decisions of the RBI Board, and (d) Whether the RBI is managing the risks to its functioning in a reasonable manner. Tables 6 shows that the RBI Act does not compel RBI to maintain any internal accountability or other mechanisms to review its own efficiency and performance. More importantly, the law does not mandate RBI to set goals or parameters against which its performance can be measured. IFC has, on the other hand, built in internal review and performance-setting obligations against which the regulator as well as external observers can measure its performance. Is there a process for deciding which portions of the minutes ought not to be published? NA Yes, reasons for not publishing must be recorded at the meeting, voted upon by a majority of the members of the Board and the vote of each member on the proposal to redact or not publish, must be published. Do redacted portions of minutes ever get published? NA Yes, within six months, or as soon as the reasons for their delay cease to be applicable, whichever is later. The main takeaways from Table 7 are that while one has to rely on the RTI Act to obtain a copy of the minutes of the board meetings of RBI. Application under RTI involves a monetary and non-monetary cost, and such attempts could fail. IFC mandates publication of the minutes, on an automatic basis, including in particular votes casted by members. The comparative overview given above should help visualise how the recommendation to demonetise currency might have unfolded under the FSLRC framework. We attempt to do this through a prism of questions and answers. Post demonetisation, the discourse on RBI board governance has focused on either the independence of RBI or the conduct of former Governors or the present Governor. This is problematic, as it misses the woods for the trees. The demonetisation event has shown us that neither sheer board strength nor a brute majority of independent directors, can ensure regulatory independence. Independence, accountability and transparency are intrinsically linked. The fact that the conduct of board members at meetings, together with details of who voted in what manner, will be published, incentivises people to vote responsibly. Hence, any argument for autonomy is rather incomplete unless it simultaneously asks for transparency and accountability. A good fallout of the demonetisation event is that it has re-invigorated debates on regulatory governance and its importance on outcomes that we generally underplay India. We must not waste this opportunity and the lessons learnt to continue our reform agenda on regulatory governance. Ila Patnaik and Shubho Roy, The RBI board: Comparison against international benchmarks, Ajay Shah's blog, January 24, 2017. Bhargavi Zaveri is a researcher at the Indira Gandhi Institute of Development Research, Mumbai. by Ila Patnaik and Shubho Roy. Reviewing, through the committee system, whether such bodies are acting in accordance with the law. An institution, as an inanimate object, does not have a human personality; it cannot reflect on its actions and change its behaviour. Rather, an institution's DNA is the law that governs it. When this institution functions in an unexpected way, one must look at the legal structures governing it. For example, in 2013, a series of unexpected corporate scams starting with Satyam rocked India. These created fresh urgency for Parliament to amend the Companies Act (1956) to address the issue. We did not stop at discussing whether Mr. Raju was a good person or a bad person; we went deeper and changed the Companies Act in ways that make such a crisis less likely. RBI's Central Board controls the functioning of the body corporate, i.e. RBI itself. Hence, the sound functioning of RBI requires sound functioning of its board. The RBI Act (1934) determines the working of RBI's Central Board. Hence, we need to examine the RBI Act, and ask whether it features sound provisions for the working of the board. In this article, we document how, when compared with similar laws in other jurisdictions, the RBI Act has many gaps in terms of transparency and accountability. Regulations are made by the Board to govern itself, which violates basic requirements of hygiene. The flaws in the RBI Act help us understand how the demonetisation event happened, and show the direction for reform. RBI does not publish either the agenda or the minutes of any Central Board meeting. All that comes out is a press release. For a contrast, consider the Bank of England (BoE), which is grounded in the same legal tradition as India. It releases the minutes of every board meeting, 6 weeks after the meeting. This flows from the Financial Services Act of 2012 . These minutes go back historically, with minutes available for as far back as 1694. By this yardstick, RBI in 2017 lags the Bank of England of 1694. "every portion of every meeting of an agency shall be open to public observation." Under this law, prior notice stating the meeting agenda must be given for every open meeting (Example). Accurate minutes or transcripts are published after each open and closed meeting (Example), and a live video is provided for open meetings. If board members knew that the nation was watching each word that they uttered, each would be more responsible. Ten clear criteria are provided under which a meeting may be closed. An item has to fall within this exhaustive list to justify closing a meeting. Public choice theory teaches us that the Agent, i.e. the agency, is biased in favour of opacity. Hence, this list of permitted exclusions should be controlled by the Principal, i.e. Parliament. The contents of this list cannot be modified either by the executive or the agency. As an example, the grounds for exemption under India's Right to Information Act are written into the law and cannot be modified by the executive (e.g. Ministry of Finance) or an agency (e.g. RBI). Public notice: Even when a meeting is closed, the agency must issue a public notice containg a suitably abridged agenda, and stating that it proposes to hold a secret meeting. Transcripts and minutes: The agency must maintain transcripts and minutes of closed meetings. Any agenda item discussed that does not meet the criteria closing the meeting is made available to the public. The rest of the proceedings are kept in order to be released once the reasons for confidentiality cease to exist. For parts of a meeting to be closed and minutes withheld, the majority of the entire membership of the agency (not just those present and voting) must vote in favour of each agenda item or portion of the meeting to be closed. The working of RBI, which is coded in the RBI Act, 1934, is inconsistent with contemporary thinking in Indian public administration. As an example, six years ago, the Chief Information Commissioner ordered RBI to disclose minutes of the board meeting. Oddly, this instruction appears to have been ignored. The Board reviewed the current economic situation, global and domestic challenges and other specific areas of operations of the Reserve Bank of India. Let us compare this against the equivalent institution, the Court of Directors of the Bank of England. They publish detailed minutes of each meeting. These minutes record attendance and, excluding confidential elements, report in detail the views of each member on various issues such as risk profile; supervision functioning; monetary policy report; financial stability report, etc. Similarly, while minutes of a single meeting of the New York Federal Reserve Board are around 6000 words, and those of the BoE Court of Directors are around 2100 words, RBI's press release is 142 words long. This either shows that the Central Board does not deliberate, or that the deliberations are not being released. The Committee of the Central Board shall have full powers to transact all the usual business of the Bank except in such matters as are specifically reserved by the Act to the Central Government or the Central Board. Two directors of whom one shall be a director nominated under section 8(1)(b) or 8(1)(c) or 12(4) of the Act shall form a quorum for the transaction of business. RBI has a sanctioned strength of 21 directors. However, only 10 are currently appointed. But, since the Committee of the Central Board can take most of the decisions with just two directors, the debate about the size and vacancies on the Board becomes moot. This committee can carry out all tasks, except those specifically allocated to the Central Board. Mr Jones noted that the Accounts were likely to show an onerous lease provision of £24mn, reflecting the Bank's assumption of the unused space at Canary Wharf formerly occupied by the FSA, unless tenants could be found. Negotiations with several possible tenants were in train. The Central Bank of Canada, among other disclosures, also provides a list of all contracts above CAD 100,000 every quarter. For example, in the 3rd quarter of 2016, Bank of Canada paid Diebold Company of Canada, a manufacturer of ATMs and security systems CAD 150,000. Under the rule of law, agencies and persons should be judged against set principles of law. However, in India, Parliament has set very low standards of transparency and accountability in the RBI Act (1934). Parliamentary committees with the power to hold government agencies accountable is a healthy feature of democracy. However, with the present silences in the RBI Act, the current approach where the Legislature questions RBI's functioning is yielding inadequate outcomes. The correct approach for the legislature is to first formulate a law mandating transparency and accountability, from the Central Board and the organisation. The draft Indian Financial Code addresses most of the current concerns. After that, Parliament it must conduct regular oversight meetings (through the parliamentary committees) to hold the agency accountable against the mandated standards. Ila Patnaik and Shubho Roy are researchers at the National Institute of Public Finance and Policy, New Delhi. The authors thank Nelson Chaudhuri, and Sanhita Sapatnekar of NIPFP for their inputs. by Pratik Datta and Prasanth Regy. The key test of any default resolution process is: how much value is recovered by the lender? The most important factor that determines this amount is the time taken to complete the resolution. India has set up many recovery mechanisms that have given us long delays and low recovery rates. Most of the delay in the resolution is due to poor judicial processes that enable parties to obtain repeated adjournments. The Insolvency and Bankruptcy Code (IBC) offers us a new beginning to fix the problem of low recovery. It imposes several timelines on its Adjudicating Authorities (National Company Law Tribunal (NCLT) for corporate defaults and Debt Recovery Tribunals (DRT) for individuals). For instance, it requires these tribunals to complete insolvency resolution in 180 days. It also requires NCLT to ascertain the existence of corporate default within 14 days of an application. Commentators have pointed out that without digitised credit data from Information Utilities (IUs), it will be difficult to adhere to these timelines. In this article, we argue that even with the IUs in place, it will be difficult to meet the timelines unless NCLT's procedures are redesigned. As an example of an IBC time-limit, consider the process laid out by the Code in the case of a corporate default. A creditor can apply to NCLT to initiate an Insolvency Resolution Process (IRP) against the debtor. Along with the application, the creditor needs to do two things: furnish evidence of default recorded in an IU (or other evidence of default); and propose the name of a resolution professional (RP). On receipt of the application for IRP, NCLT has 14 days to accept or reject it. The application is accepted only if NCLT is satisfied that default has occurred, and that the proposed RP has no disciplinary proceedings pending against him. Now let's see how this process will actually work out under the current NCLT rules. type-written, lithographed or printed in double spacing on one side of standard petition paper with an inner margin of about four centimeter width on top and with a right margin of 2.5. cm, and left margin of 5 cm, duly paginated, indexed and stitched together in paper book form. E-filing is promised eventually: the application ... shall be filed in electronic form, as and when such facility is made available . Online payment of fees is not allowed: fees can be paid only by means of a bank draft . NCLT has to make a reference to IBBI to check if there are any disciplinary proceedings pending against the proposed RP. This reference will be sent by post, and the reply from IBBI will likewise come by post. It is not clear how IU records are to be submitted to NCLT: if the Tribunal requires that all IU records need to be certified by a senior officer of the IU (like in the case of bank records) it will lead to more delays. All these have to be done while the NCLT is dealing with its workload under the Companies Act. On top of these, it is estimated that under the IBC, about 25000 cases will be transferred to NCLT from Company Law Board, the Board for Industrial and Financial Reconstruction (BIFR), the High Courts, and DRTs. This combination — a gargantuan workload, and slow processes to deal with it — makes it unlikely that the NCLT will be able to respect the IBC timelines. The Bankruptcy Law Reforms Committee recognised this problem and suggested the extensive use of technology by NCLT and DRTs to achieve efficiency. If we are serious about meeting the IBC timelines, NCLT's procedures will have to be designed anew. Let us revisit the previous example in this light. Submission of the application for initiating IRP should be electronic: all documents, including IU records, should be submitted online. This will make it easy to verify the evidence of default. The tribunal must not require any certification from IU officials that the IU record is authentic — the digital signature on the IU record should suffice. Verifying the RP's antecedents with the IBBI should be automated: it should only involve a computer at the NCLT querying another computer at IBBI. With these processes, the tribunal stands a far better chance of meeting the 14-day timeline. Of course, meeting this deadline in and of itself is no fix to the issue of delayed recoveries. However, this deadline is crucial for two reasons: firstly, because insolvency resolution cannot begin till the application is accepted, so any delay in this process delays the eventual resolution as well; and secondly, once a precedent of ignoring IBC timelines is established, there is no reason to respect the sanctity of any other timelines in the Code, including the 180-day limit on resolution. The Code will lose one of its most compelling features. India has been here before. We have created a long list of mechanisms to facilitate the recovery of debts. This includes the BIFR set up in 1987, the Company Law Board set up in 1991, the Recovery of Debts Due to Banks and Financial Institutions Act passed in 1993, and the Securitisation and Reconstruction of Financial Assets and Enforcement of Security Interest Act passed in 2002. The RBI also has tried several schemes, including Corporate Debt Restructuring (2001), Joint Lenders' Forum (2014), Strategic Debt Restructuring (2015), and the Scheme for Sustainable Structuring of Stressed Assets (2016). None of these have been successful in resolving defaults efficiently. We have another list of laws (including the IBC) that seek to impose deadlines on the judiciary. In the absence of rigorous process design, such attempts to eliminate judicial delays through legislative fiat have not worked either. Instead, there is ample precedent of ignoring these deadlines. Now the IBC affords us yet another opportunity to achieve the goal of prompt recovery of debts. High-quality intellectual work is required to design and implement good judicial procedures for NCLT and DRT. If we do not make this investment now, IBC will also be a failure. Bankruptcy Law Reforms Committee. The Report of the Bankruptcy Law Reforms Committee Volume I: Rationale and Design. Government of India, 2015. The authors are researchers at the National Institute of Public Finance and Policy, New Delhi. We thank Anirudh Burman, Suyash Rai, and three anonymous referees for helpful comments. by Amba Kak, Mayank Mishra and Smriti Parsheera. The Telecom Regulatory Authority of India (TRAI) has issued a Consultation Paper (CP) on Net Neutrality seeking inputs for the formulation of final views on the subject. This comes almost a year after TRAI's regulation prohibiting discriminatory tariffs for data services based on content, framed using its power to determine the rates at which telecommunication services are to be provided. The present exercise covers a broader canvas of trying to identify the acceptable limits of interference in the provision of Internet access services. This includes practices like blocking, degradation or prioritisation of specific traffic, which often form the focus of the net neutrality debate. In TRAI's words, it is an attempt to "rethink the first principles of traffic management by telecom service providers (TSPs)". While issuing the discriminatory tariff regulation, TRAI had highlighted the importance of "keeping the Internet open and non-discriminatory". This idea also flows through the CP and the pre-consultation paper that preceded it in May, 2016. In fact, TRAI acknowledges in the CP that the term "net neutrality" is being used in its commonly understood sense of equal or nondiscriminatory treatment of content while providing access to the Internet. The word "equal", however, does not appear in the ultimate question posed by TRAI on what should be the "principles for ensuring nondiscriminatory access to content". The CP does not clearly spell out the reason for this. It could be due to the difficulties of monitoring equality in a best efforts delivery system; or perhaps because the term non-discriminatory already captures the concept of equality. The CP is reasonably comprehensive in its coverage of all major aspects that countries have considered while formulating their positions on net neutrality. Several of these, like reasonable traffic management, scope of prohibited activities and need for transparency were also discussed by TRAI at the pre-consultation stage. The difference, however, is that this CP takes a deeper dive into those issues, identifying the different approaches that could be considered and, in some cases, also weighing their pros and cons. On some issues, TRAI explores new areas, not covered in its earlier papers on the subject. The following are some key points discussed in the CP. First, TRAI notes that each country's approach on net neutrality is defined by its local context. Accordingly, it refers to some India-specific factors that may influence its approach. These include, the predominantly wireless character of access services -- 97 percent of Internet subscribers are on wireless networks. The CP later explains that traffic management on wireless networks may pose certain unique challenges due to spectrum constraints and variable usage patterns. It also refers to India's circle-wise licensing regime which often results in the usage of third party networks outside one's home service area. TRAI queries, who will be responsible for any neutrality violations in such situations? Second, the CP raises pertinent questions about the appropriate footprint of regulation, in terms of the services that are covered and the persons rendering them. In particular, it refers to the potential exclusion of "specialised services", which could be defined in several different ways. The manner in which India eventually chooses to answer this question will have far reaching effects on the adoption of future technologies in the country, particularly in the context of the Internet of Things revolution. Third, beyond trying to identify the reasonable limits of traffic management, this CP gets into more practical aspects of detection and monitoring of violations. It also suggests a collaborative approach for implementing the operational aspects of net neutrality, which, if adopted, would be a novel approach for the Indian telecom sector. Fourth, TRAI discusses the role of disclosures and transparency in guarding against discriminatory traffic management practices, an issue that was also raised in earlier consultation papers. However, in this case, it goes on to suggest two approaches on how this can be achieved -- a "direct approach" that would require a TSP to make specific disclosures only its own users; and an "indirect" one would also involve transparency towards third parties like content providers, consumers groups, research organisations and users of other TSPs. The chapter on "Traffic Management" in the CP sets out the crux of the net neutrality policy debate. First, it explains why traffic management is an integral function of access providers -- to address congestion, security and the integrity of the network. Next, it notes that while such motivations for traffic management practices (TMPs) could be considered "reasonable", others might be "non-reasonable" due to their potentially discriminatory and anti-competitive effects. As such, it explains why regulating traffic management is being considered as a policy option and then mulls over the varied regulatory approaches that could be adopted. Congestion management, which is explained in terms of the variability of demand or "peak-load", particularly on wireless networks, is explained to be one of the reasons for which access providers might legitimately engage in TMPs. TRAI recognises that the real solution to such issues lies in enhancing the overall network capacity but goes on to note that "even in a situation of enhanced capacity, some degree of scarcity might persist", hence creating a role for traffic management. The key takeaway from this discussion is that "differences in network architecture and technology" will play a role in assessing the reasonableness of any TMPs. Next, the CP highlights that the same commercial considerations that prompt the use of traffic management tools to improve network performance could also become the cause of exclusionary or discriminatory practices. It notes that there have been global examples of TSP interference in networks for patently anti-competitive purposes, namely "service blocking, prioritising affiliated content provider services or throttling competing ones". While this explains the calls for regulation, traffic interference driven by commercial arrangements is not the whole scope of TRAI's enquiry. Instead, the CP provides two conceptual frames that might be used for such regulation -- the "broad approach" and the "narrow approach". The "broad approach" appears to be a principles-based approach to identifying which practices would be considered reasonable. Drawing from the European Union's regulations, it refers to guiding principles like proportionality, non-discrimination, transparency and absence of commercial considerations that can be used to define the bounds of reasonableness. Practices like application-specific discrimination, throttling encrypted content, deep packet inspections, etc. can then be tested against these standards. In contrast, the "narrow approach" will confine itself to formulating a "negative list" of practices that will not be permitted, without going into the contours of reasonableness. TRAI leaves the content of the negative list open for discussion, but gives the specific example of practices motivated by commercial/strategic partnerships with content companies as a potentially proscribed activity. The distinction between the two approaches does not appear to be one of mere semantics. The paper acknowledges that a negative list is, by nature, likely to be restricted to situations that we are aware of today -- "This may motivate providers to develop other types of business practices that are not explicitly covered in the narrow restrictions although they may have similar harmful effects". It also notes that there could be difficulties in establishing a commercial motive. One way to address this could be to treat the lack of any objective/ technical reasoning for a traffic shaping practice as being indicative of "commercial motive", even where this may not be explicit. By weighing these different approaches, TRAI seems to acknowledge that regulating TMPs is a tricky exercise, with high likelihood of false positives and negatives. Narrowly defined ex-ante rules may therefore be an uneasy fit with the complex and technical nature of traffic management. The controversy over AT&T restricting Apple's FaceTime application, its high-quality video-calling service, on its cellular network, presents an interesting example. In 2012, when Apple first launched FaceTime for use on mobile networks, AT&T declared that the service would be available only on select pricing plans. On the face of it, this constitutes an application-specific discrimination that violates net neutrality principles, as pointed out by many neutrality advocates. The case, however, also throws up several complex issues, which were discussed in the case study prepared by a Working Group of FCC's Open Internet Advisory Committee. First, pre-loaded applications, like Facetime, are likely to enjoy more large-scale adoption, thus more likelihood of creating pressure on the network -- only about 10 percent iPhone users voluntarily downloaded Skype, while all had Facetime preloaded on their phones. Second, high-bandwidth video calling applications put a particular strain on mobile data networks, in both the upstream and downstream direction. FaceTime, in particular, was found to consume "on average 2-4 times more bandwidth than a similar Skype video call" at that point of time. Third, limited trial deployment of a new application, for instance, by limiting it to particular pricing plans, could be useful for gathering measurement data to assist in developing better TMPs. Fourth, application management can take place on the device, as was happening in this case, or on the network -- "whether it matters where an application-management decision is enforced, and which organization decides on it". TRAI has also touched upon some of these aspects in the CP by raising questions on "application-specific discrimination", "duty-bearers" in a net neutrality regime and impact of traffic management at the level of the device or operating system being used by a person. The public discourse that preceded the discriminatory tariff regulation took place in the shadow of Facebook's Free Basics offering. It led to heated debates and sharply polarised views, many of which were focused on the specifics of Free Basics. In contrast, this current consultation is taking place in a relatively less charged environment, with no poster child violation. This presents an opportunity for the regulator and stakeholders to proactively engage with one another for developing a suitable framework for India that can be tested against a range of potential practices. The real test will be to ensure that whatever principles India chooses to adopt at this stage convey a strong regulatory message on non-discrimination, but also have the flexibility to adapt to the dynamic environment of this industry.